If you are a magician or psychic entertainer looking for something different and exciting to add to your act, then your search is over! The Spirit Rope Tie, long a staple of bogus spirit séances, offers the clever performer a fantastic array of performance possibilities for injecting fun, humor or mystery into his or her show. 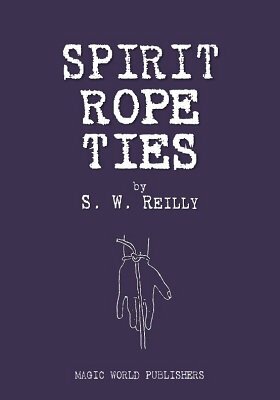 Whether played "straight" as a recreation of a vintage spirit séance, or as a comedic effect that gets funnier with each repetition, any one of the rope ties described in the ebook is strong enough to be a reputation maker for you. Reilly doesn't make the reader wade through scores of pages before getting to the heart of the matter, either. The very first tie he describes offers a lightning fast, instantaneous release method, in spite of the knots being tied by an audience volunteer. As a bonus, included in this revised and expanded edition are several performance suggestions, including some comedy byplay ideas. 1st edition 1937; expanded digital edition 2017, 28 pages.